On July 8, 1947, a New Mexico newspaper, The Roswell Daily Record, issued a stunning story about the Roswell Army Air Field: “RAAF Captures Flying Saucer on Ranch in Roswell Region,” read the headlines (“RAAF” 1947). The story came from a press release issued that same day by an eager, but relatively inexperienced, public information officer at the airfield. The next day’s paper told how rancher “Mac” Brazel had described an area of the wreckage that consisted of (in the reporter’s words) “rubber strips,” “tinfoil,” “a rather tough paper” (with “eyelets”), “sticks,” and “tape” (“Harassed Rancher” 1947). If that doesn’t sound like an extraterrestrial craft, it wasn’t. It was soon identified as a weather balloon, although, in fact, as we now know, it was actually a balloon array with dangling box-kite–like radar reflectors (made of balsa sticks and foiled paper), that had gone missing in flight from a secret Project Mogul launch. Mogul was an attempt to use balloon-borne instruments to monitor sonic emissions from Soviet atomic tests. The late Charles B. Moore, former Mogul scientist, confirmed for me his identification of the Roswell wreckage as consistent with a lost Flight 4 Mogul array (Moore 1997; Saler et al. 1997; see also Thomas 1995; McAndrew 1997). Nevertheless, mysteries remain, including persistent claims that the debris was not of terrestrial origin after all. I call this process “The Roswellian Syndrome,” and it is found in such subsequent UFO-cases-turned-conspiracies as those at Flatwoods, West Virginia, in 1952; Kecksburg, Pennsylvania, in 1965; and Rendlesham Forest, England, in 1980 (Nickell and McGaha 2012). In each case, it seems, the mythmaking continues, as mystery mongers and conspiracy hucksters mine the burgeoning accounts for more details to hype. With The Roswell Incident, some of these details concern the nature of the debris at the crash site. Major Jesse Marcel, USAF retired, was a leading claimant. He had helped retrieve the wreckage, but in time began to make self-contradictory and inflated assertions about the amount of debris and its properties. He said that while the sticks resembled balsa, “they were not wood at all” and had “some sort of hieroglyphics on them that nobody could decipher.” (Actually, those were only little floral designs on the tape.) And of the metal, he said it was “like tinfoil, except that it wasn’t tinfoil” (Berlitz and Moore 1980, 65). Unfortunately for his credibility, Marcel also made false claims about himself—that he had a college degree, had been a pilot in World War II who had received five air medals for shooting down enemy aircraft, and other falsehoods (Fitzgerald 2001, 511; Korff 1997, 27). However, his comments about the tinfoil-like material deserved further study. Major Marcel stated, over three decades later in 1979, that the metal was exceedingly thin. “It was possible to flex this stuff back and forth, even to wrinkle it, but you could not put a crease in it that would stay, nor could you dent it at all”—not even with a sledgehammer.2 “I would almost have to describe it as a metal with plastic properties” (Marcel 1979). Note that Major Marcel and Brazel’s son Bill used similar phrasing to describe the foil-like material—Marcell referring to “a metal with plastic properties” while Bill Brazel said it was “Like a plastic of some sort, except that it was definitely metallic in nature.” Unfortunately, pieces of the original material from the crash site were not kept either by Marcell or the Brazel families, both having turned in all the debris they found (Berlitz and Moore 1980, 71–72, 83–84). So, what was the metal? These balloons were made of polyethylene—Mylar being a trademark—that had been “aluminized,” that is, coated with aluminum. The use of such material for high-altitude balloon construction was an outgrowth of research conducted by Charles B. Moore for Project Mogul (McAndrew 1997, 40). A piece of the silvery material would have been a novelty in the years following The Roswell Incident, because—while looking like aluminum foil—when crumpled it had the eye-catching ability of returning to its original shape. And it indeed had both metallic and plastic properties as described by Major Marcel and Bill Brazel. I spoke with Charles B. Moore (1997) about this very issue. He noted that the silver-colored (aluminized) polyethylene was not available before the 1950s. (However, neither was there any record of anyone describing the Roswell metal as having uncrumpling properties before that time.) Moore believed the most likely scenario was that, sometime about 1954 or later, someone had circulated some of the aluminized Mylar they had discovered that was confused with the Roswell tinfoil. In brief, the foil originally found among the “crashed saucer” debris by “Mac” Brazel was the same as that on the radar reflectors of Project Mogul’s flight 4 balloon array, as shown by much corroborative evidence. This includes Brazel’s own description, the photographs of the debris (McAndrew 1997, 7, 8), and the expert opinion of Charles B. Moore of Project Mogul. In contrast, the unusual, supposedly extraterrestrial material—described as looking like metal but having plastic-like properties—fits the characteristics of aluminized Mylar, small pieces of which were subsequently found in the desert. As I have shown in simple experiments in my lab (see “The Real ‘X-Files’?” 2015), such material is exceedingly lightweight, resembles the described Roswellian material (being in fact metalized plastic), is exceedingly tough (resisting tearing and withstanding hammer blows), and—most significantly—after being crumpled resumes its original shape. In addition to a modern atlas, I relied on McAndrew 1997, 11; Berlitz and Moore 1980, frontispiece and 97. Exaggeration is inherent in the descriptions of the metal as indestructible—that it could not be torn or even cut (Berlitz and Moore, 180, 66). The fact that the described metal was always in pieces gives the lie to such claims. Berlitz, Charles, and William L. Moore. 1980. The Roswell Incident. New York: Grosset & Dunlap. Brazel, Bill. 1979. Interview by William Moore in Berlitz and Moore 1980, 74–83. Fitzgerald, Randall. 2001. 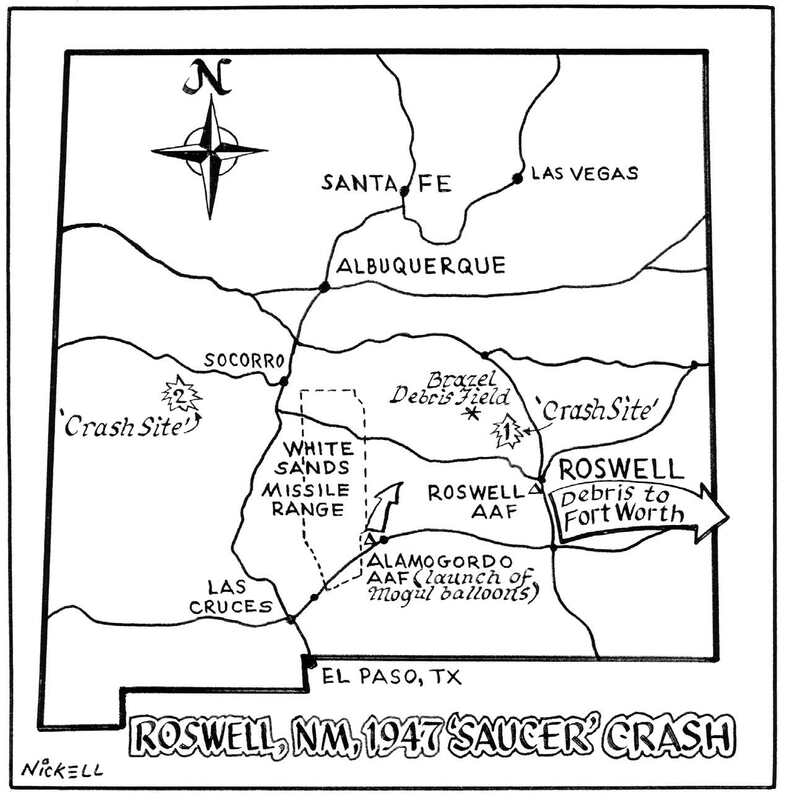 “The Roswell UFO Crash” in Ronald D. Story, Ed., The Encyclopedia of Extraterrestrial Encounters. New York: New American Library. Harassed rancher who located “saucer” sorry he told about it. 1947. Roswell Daily Record (July 9). Korff, Kal K. 1997. The Roswell UFO Crash: What They Don’t Want You to Know. Amherst, NY: Prometheus Books. Marcel, Major Jesse. 1979. Interview in Berlitz and Moore 1980, 62–70. McAndrew, James. 1997. The Roswell Report: Case Closed, USAF. Washington, D.C.: U.S. Government Printing Office. Moore, Charles B. 1997. Interview by Joe Nickell (October 31). Nickell, Joe, and James McGaha. 2012. The Roswellian syndrome: How some UFO myths develop. Skeptical Inquirer 36(3) (May/June): 30–36. RAAF captures flying saucer on ranch in Roswell region. 1947. The Roswell Daily Record (July 8). “The real ‘X-Files’?” 2015. Vice video, available online at www.vice.com/video/the-real-x-files; accessed February 16, 2016. Saler, Benson, Charles A. Ziegler, and Charles B. Moore. 1997. UFO Crash at Roswell: The Genesis of a Modern Myth. Old Saybrook, CT: Konecky & Konecky. Thomas, Dave. 1995. The Roswell Incident and Project Mogul: Scientist participant supports direct links. Skeptical Inquirer 19(4) (July/August): 15–18.